Composer #ARRahman, who has given the music for the upcoming film #SachinABillionDreams, on Tuesday said that initially the anthem song in the movie was a rap with the chants that supporters used to make during the matches on the field. Rehman said that he created 14 versions of the anthem song "Sachin Sachin" for the film that is based on the life of the legendary cricketer Sachin Tendulkar. In the presence of Sachin Tendulkar, Rehman on Tuesday launched the song and said: "We made 14 versions of the song and initially it was a rap with 'Sachin Sachin' chant (of his fans) which I liked a lot. But then we changed it musically, tried to encapsulate the energy, emotions of his journey and fans, and finally we finished the song last week." The event was graced by film director James Erskine, producer Ravi Bhagchandka, singer Sukhwinder Singh who also performed the song live on stage. 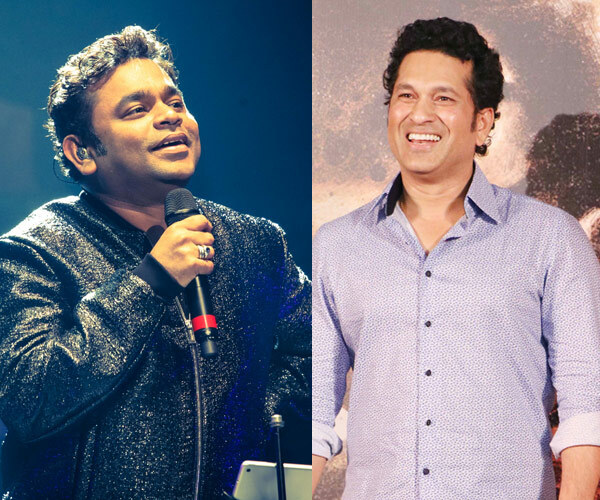 While asked about if he gave any inputs during the process of the song, Sachin replied, "What can you say standing in front of the Mount Everest? He is the ultimate, right?" The song was released with a video that has Sachin's journey from his childhood, to net practice and batting on field. Asked what was the common factor between him and Sachin, Rahman said, "Of course we have similarities, we both look young at this age! Jokes apart, I think our approach to patriotism is the same, through our work." Directed by James Erskine "Sachin: A Billion Dreams" is releasing on May 26.